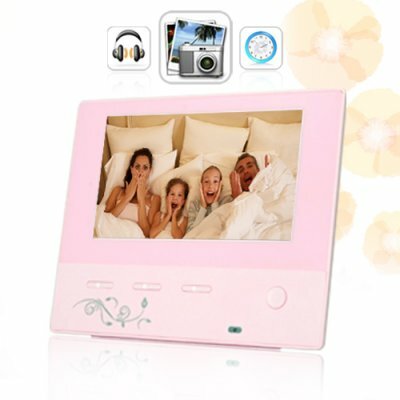 Successfully Added Bella - 7 Inch Digital Photo Frame with Media Player to your Shopping Cart. A digital picture frame that is as beautiful as the photos it holds. Presenting the Bella 7 Inch Digital Photo Frame with Media Player. Ideally sized with a crisp and vibrant 7 inch TFT LCD screen, the Bella is the perfect treasure chest for all her precious digital memories - her first steps, her first day at school, her best friends, and everything in between. Birthday, Christmas, or just as an excuse to show you care, this makes a great gift for all the wonderful women in your life - daughter, sister, mother, grandmother, girlfriend, wife...and it's so easy to use. Just throw all your media onto a memory card and insert it into the unit's SD card slot! The Bella displays photos one at a time or in different slideshow formats, it plays all the most popular audio and video files like MP3, WMA, AVI, DIVX, and MP4, and it has great time and date related software like clock, calendar, and alarm. It even lets you read ebooks! What makes the Bella digital picture frame better than all the others? It functions as beautifully as it looks. And that's important when you are giving this as a gift to all the special people in your life. Buy one for all the girls in your life, and then buy a dozen more to sell on your online store - brought to you by the online leader in direct from China wholesale electronics, Chinavasion. Repeat file, folder, or all files! so i aint giving you ant star. Thnx chinavasion , im very happy with the product , its A Quality and works perfect. I asked if you could deliver the item to me before x-mas and you did ! great service and mega fast shipping ! 3 days from china to europe/the netherlands with DHL. Thnx alot and happy holidays from The Netherlands.